What to expect from the process, and what documents would need to be prepared by your lawyer? What documents and forms would comprise the ‘Main Application’ for the Grant of Probate, and what you should take note of. In this article, which is the first in the series, we will look at what you can expect in the process of applying for the Grant of Probate, and what documents would need to be prepared by a lawyer. I’ve been named the executor of a testator’s will. What am I supposed to do? As an executor appointed by the maker of the will, called the testator (the “testator”), the executor has the responsibility to pay off the testator’s debts and liabilities as at the date of his death and to call in, manage and distribute the testator’s assets to his/her beneficiaries named in the said will. In order for the executor to be recognised as the testator’s appointed executor, and take up that responsibility, the executor needs, first, to be legally appointed as the personal representative of the estate of the testator. This is done by way of a Court application to the Family Justice Courts for a Grant of Probate. It is advisable that the executor approaches a lawyer to help his/her in his/her Court application for a Grant of Probate. Although the powers of the executor are derived from the will of the testator and take effect from the time of his death, without the “Grant of Probate” giving the executor the authority to deal with the testator’s assets, the executor would generally be unable to transfer, sell, or deal with the testator’s assets. During this interim period, the executor should take all steps to preserve the assets of the estate of the testator. Once the “Grant of Probate” is obtained, there would be a Schedule of Assets attached to the said grant, detailing the list of testator’s assets and liabilities. The executor is only able to deal with assets and liabilities as listed in the said schedule. It is therefore important that the Schedule of Assets comprises all of the testator’s assets and liabilities as at the date of his death. Upon the receipt of the Grant of Probate with the Schedule of Assets attached, the executor is then able to call in the assets, such as, close bank accounts, collect insurance proceeds of payment and/or transfer assets such as, HDB flat, private property(ies), shares, and car(s), depending on the wishes of the testator as set out in his will. The executor should pay off all the testamentary expenses, debts and liabilities of the testator prior to the distribution of the testator’s estate to the named beneficiaries. It is important that the executor have each of the beneficiaries sign off the receipt of his/her inheritance upon the executor’s distribution of the same to each of the beneficiaries. How long would it take for the executor to obtain the “Grant of Probate”? In general, if all information required is available and the value of the assets are easily ascertainable, the time taken to complete the process for the application of Grant of Probate can be as short as 2 – 4 months from the time the first Court papers are filed. Otherwise, on average, it might take about 6 months or more if an executor requires time to identify the assets of the deceased and ascertain their values thereof, and especially more so if some of those assets are located overseas. It is common for the executor to be unfamiliar with all the assets of the testator, especially if the testator did not leave a comprehensive list of his assets for his executor and had many assets at the time of his death. 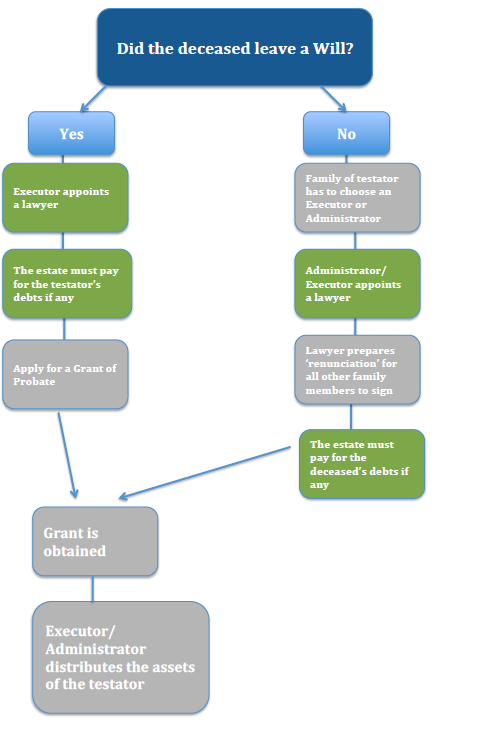 The Court process to obtain a “Grant of Probate”? Generally, the probate and administration of estate falls under the purview of the Family Justice Courts. An application will be made to the High Court division of the Family Justice Courts if the testator’s assets exceed S$3 million. on the Court granting the probate in favour of the executor, extracting the Grant of Probate with the Schedule of Assets. inheritance certificate from Syariah Court for muslims, if applicable. So what kind of Court documents would the executor expect his/her lawyer to handle? Generally, “ex parte” means “from (by or for) [the/a] party.” In the context of this form, it means that there are no other applicants to the application for the “Grant of Probate” other than the executor. The information required for this form includes the details of the executor and the testator. The lawyer will write out the prayer for the granting of the probate in favour of the executor. confirmation that probate application is filed within 6 months from the death of the testator and if outside of 6 months, the reason(s) for the delay in the said application. A certified true copy of the death certificate needs to be submitted with the Court, but the lawyer would be able to certify this upon the executor’s production of the original death certificate for his/her inspection. If the original death certificate is unavailable, a certified extract of the death certificate may be purchased from the Registry of Births and Deaths at the Immigration and Checkpoint Authority. As with the death certificate, a certified true copy of the will must also be filed with the Court. The lawyer will retain the original will as the same has to be submitted to the Probate Counter of the Family Justice Courts by 4:30 pm the following day after the first filing of the probate court papers of verification of the authenticity of the said will. Upon the said verification, the said original will will be returned to the lawyer. The lawyer will also conduct a search for any prior caveat and probate application(s) that might have been filed in relation to the testator’s estate since his/her death. A summary of the said search result is required to be attached to the aforesaid original summons at the time of the filing of the said summons. Where there are no caveats or prior probate applications filed against the said estate, then the probate application is likely to proceed without much complication. However, if there said search result shows that there are caveat and probate applications filed, then there is possibility that the executor might be facing a potentially contentious probate application. In this section, we looked at what you can expect in the process of applying for the Grant of Probate, and what are documents that need to be prepared by a lawyer. In our next article, we shall examine what documents and forms would comprise the ‘Main Application’ for the Grant of Probate, and point out potential issues that you should take note of. Have a question on Grant of Probates? If you have any questions about Grant of Probates, you can request a quote with Aye Cheng or get a Quick Consult with other lawyers from a transparent, flat fee of S$49. With Quick Consult, a lawyer will call you back on the phone within 1-2 days and give you legal advice. 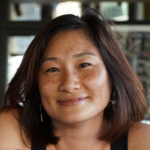 This article is written by Aye Cheng Shone from A C Shone and Co. and edited by Tang Chee Seng from Asia Law Network.